The 14th meeting of the Conference of the Parties to the Convention on Biological Diversity (CBD), and the third meeting of the Parties to the Nagoya Protocol [pdf] on Access to Genetic Resources and the Fair and Equitable Sharing of Benefits Arising from their Utilization is took place from 13-29 November. After long and arduous discussions in closed informal groups, CBD delegates agreed on two resolutions on digital sequence information – one for the CBD, and one for the Nagoya Protocol. At stake is how to deal with digital sequence information, in particular for benefit-sharing purposes, as such information can be used and replace physical material in research and development of products. The decision [pdf] on the CBD requests several studies: one of them is a science-based, peer-reviewed, fact-finding study on the concept and scope of digital sequence information on genetic resources and how digital sequence information on genetic resources is currently used. Another study is a peer-reviewed study on ongoing developments in the field of traceability of digital information, including how traceability is addressed by databases, and how these could inform discussions on digital sequence information on genetic resources. Finally, according to the decision, a peer-reviewed study should be commissioned on how domestic measures address benefit-sharing arising from commercial and non-commercial use of digital sequence information on genetic resources for research and development. Earlier in the week, late into the evening, the contact group reached a “package compromise” solution by removing remaining brackets in a way that was conducive to agreement. The decision requests that an open-ended working group make recommendations to the next CBD Conference of the Parties in 2020 on how to address digital sequence information on genetic resources in the context of the post-2020 global biodiversity framework. The decision [pdf] adopted yesterday for the Nagoya Protocol recognises the decision approved on digital sequence data for the CBD, and requests the open-ended working group established by the CBD decision to make recommendations to the Conference of the Parties to the Nagoya Protocol at its next meeting in 2020. The decision was slightly amended upon the request of the European Union. The delegate notably asked that the reference to Article 17 (Monitoring the utilization of generic resources) be removed in the preamble of the decision. Earlier this week Switzerland reiterated its position on benefit-sharing for digital sequence information. 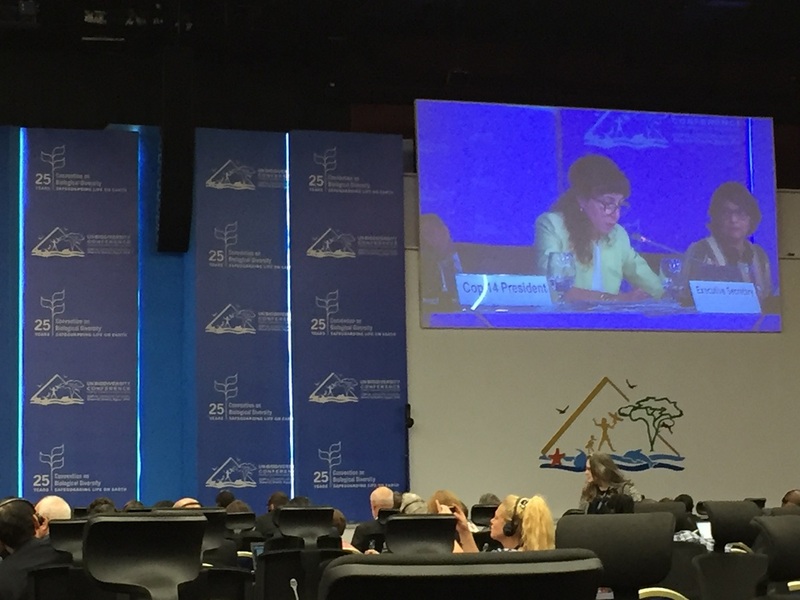 The Swiss delegate said access and benefit-sharing under the Nagoya Protocol and the CBD refer to tangible matter, and not to digital sequence information. While recognising the importance of technical development, conservation, and deeper scientific understanding, Switzerland found there is no need for a specific decision for the Nagoya Protocol on the question of digital sequence information, he said, adding that Switzerland does not support the decision. The Japanese delegate said Japan has the same interpretation of digital sequence data as Switzerland and confirmed that Japan considers that genetic resource is a tangible matter and digital sequence data is not genetic resources. Uganda for the African Group said the group feels very strongly in favour of the decision about digital sequence information relating to the Nagoya Protocol, and finds it justified. The chair of Working Group I where the decision took place earlier this week said a mandate was given by the 13th CBD Conference of the Parties, and the 2nd Nagoya Protocol Conference of the Parties to have a decision on digital sequence data for the Nagoya Protocol. He suggested that the objection of Switzerland and Japan be noted. Also adopted yesterday was a decision [pdf] on a potential Global Multilateral Benefit-Sharing Mechanism, object of Article 10 of the Nagoya Protocol [pdf]. Article 10 calls for member states to consider the need for and modalities of a global mechanism to address situations, such as transboundary situations for which it is not possible to grant or obtain prior informed consent. The decision requests the CBD secretariat to commission a peer-reviewed study to identify specific cases, to compile and synthetize the information, and submit the study and the synthesis for consideration by the Subsidiary Body on Implementation. The subsidiary body is then tasked with making a recommendation to the next meeting of the Nagoya Protocol Conference of the Parties in 2020. A similar decision [pdf] on conflict of interest was adopted by the parties of the Nagoya Protocol. "CBD Biennial Meeting Closes With Resolutions On Digital Sequence Data, Conflicts Of Interest, Global Benefit-Sharing" by Intellectual Property Watch is licensed under a Creative Commons Attribution-NonCommercial-ShareAlike 4.0 International License.